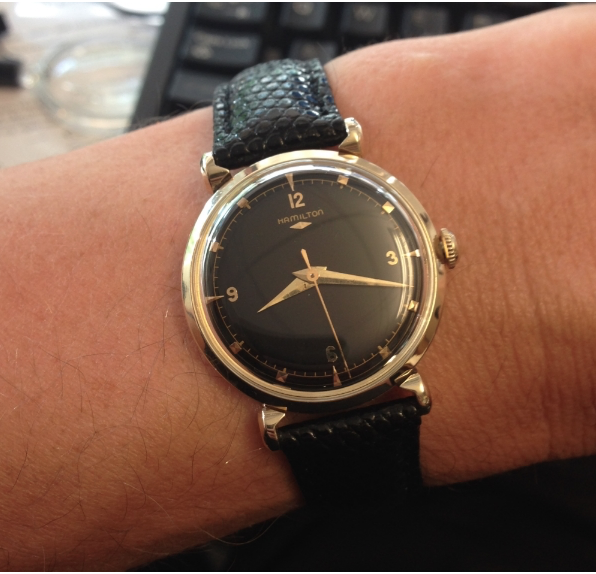 I think my favorite period for Hamilton watches is the 1930's. I must be an "old soul" as I am very drawn to the styles that were produced during the Great Depression. 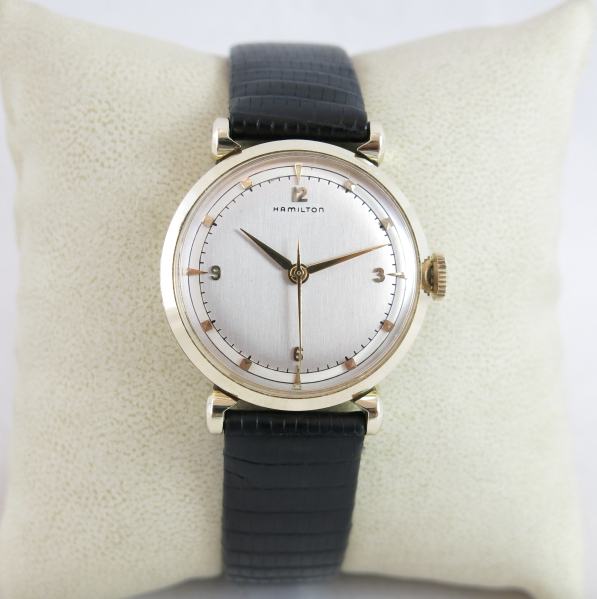 Second on my list of interesting watches are probably the 1950's models. 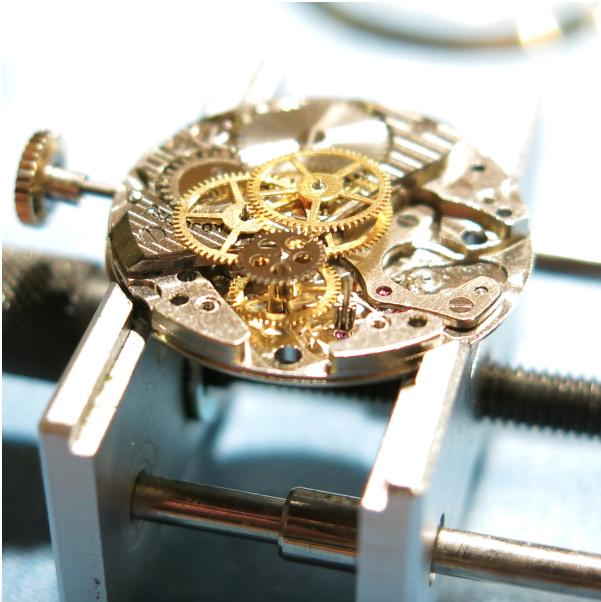 The watches started to get bigger, and automatics and electrics were introduced. It seemed the best of Hamilton's established traditions were mixed with new and innovative concepts during the 1950's. 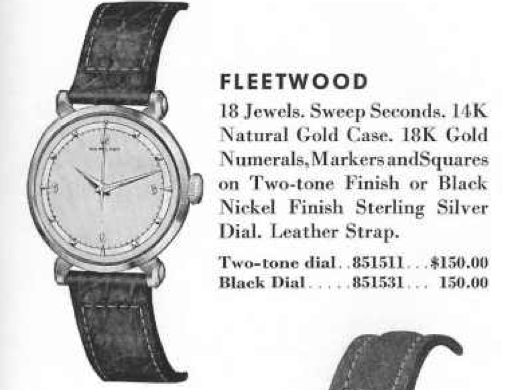 A good example of a 1950's watch is the 1952 Fleetwood. It was produced for three years. The Fleetwood is a good sized watch. 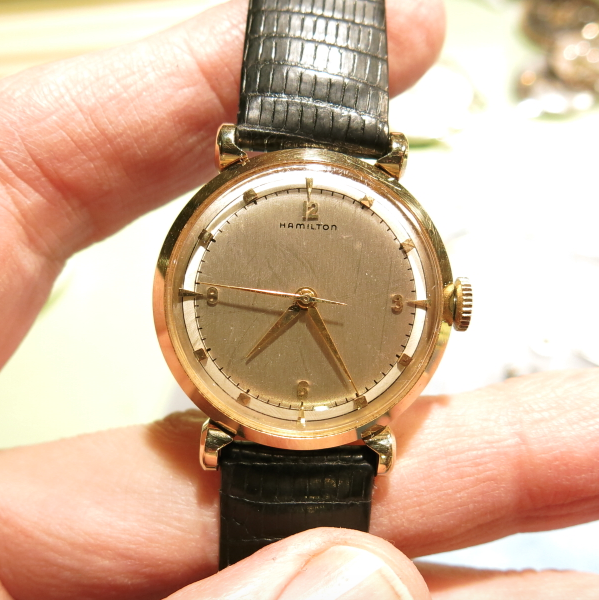 Strikingly larger than any1940's model, when watches were considerably smaller. 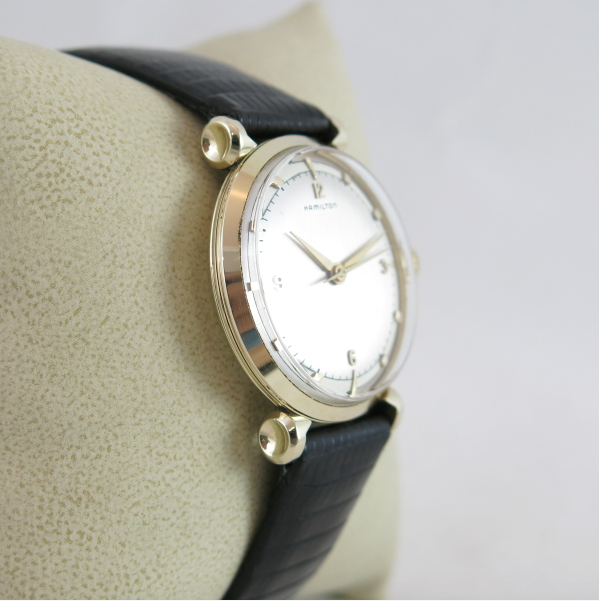 The model came in a solid 14K yellow gold case with a two-tone sterling silver dial with solid 18K gold numerals, markers and squares. 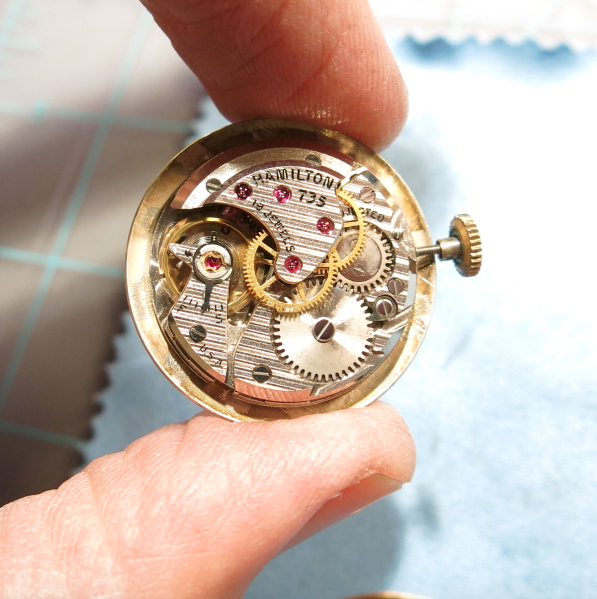 Behind the dial is Hamilton's 8/0 size, 18 jewel sweep second movement, most likely the 748 or maybe the 735 - which replaced the 748. You may wonder what's so innovative about the Fleetwood? Well, to me, it's innovative because it's size ushered in an era of much larger watches. In addition, it balances classic Hamilton high quality dial elements with a funky case design with concave lugs that are not apparent from the front. I recently received a very nice Fleetwood that was ready for some regular maintenance. 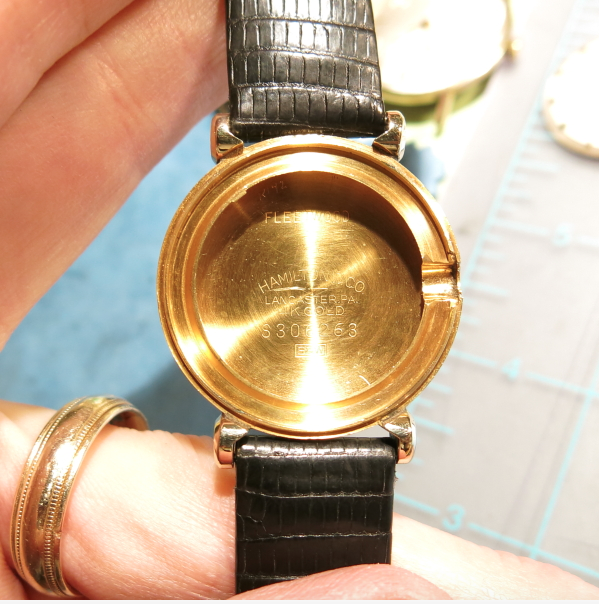 It's a good idea to get a watch serviced every 5 years, maybe less if it's worn frequently. This one just needs an overhaul and a crystal polish. 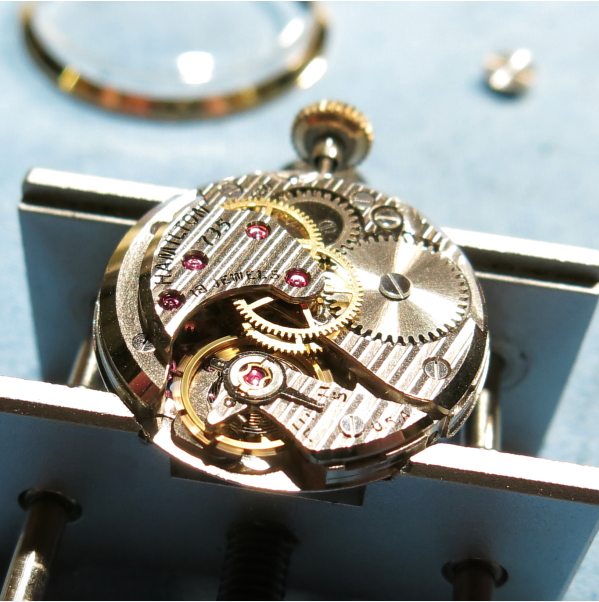 This watch has a 735 movement. It's engraved on the back as a presentation from 1953 - so maybe it's a 1954 model. I'm not sure when the 748 was replaced by the 735, I would have guessed 1955 - after the Fleetwood was discontinued. But here it is, nonetheless, so it's either an early 735 or a replacement if the 748 died. Since the rest of the watch is pristine, I'm going to go with it's original. The one thing I really appreciate with solid gold cases is they always look clean inside. Gold doesn't corrode so you don't get oxidation or the verdigris that is common in gold filled cases. Everything is disassembled, cleaned and dried. Here it's all laid out and ready for reassembly. It looks like a lot of parts but if you don't include the screws, there's only about 24 pieces to put back together. The trick is to not break them or lose them. This isn't something you do over the family room carpet, that's for sure. The trickiest part of the reinstallation is to get these four wheels to all line up when the train bridge goes back on. The empty space on the right is for the balance assembly, which will go on last. Here the balance is reinstalled and happily purring away in a blur. It's off to the timer to "listen" to how well it's running. 14 seconds per day fast with good amplitude and a low beat error. Nothing to complain about here. And here's the finished product on it's pillow shot. Everything now sparkles, inside and out and this Fleetwood is a real beauty. Here's a shot of it from the side, check out these scalloped lugs - this is a very elegant looking dress watch, in my opinion. The Fleetwood is similar to many other models from the 1950's in that it also offered a black dialed version. Black dialed models are very popular and often command a premium. Beautiful Watches. Nice work. I just bought my first Fleetwood. 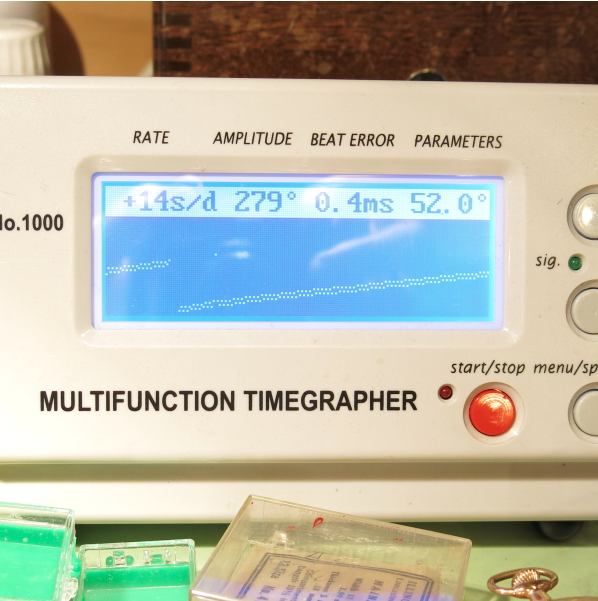 Who do you recommend for dial restoration? 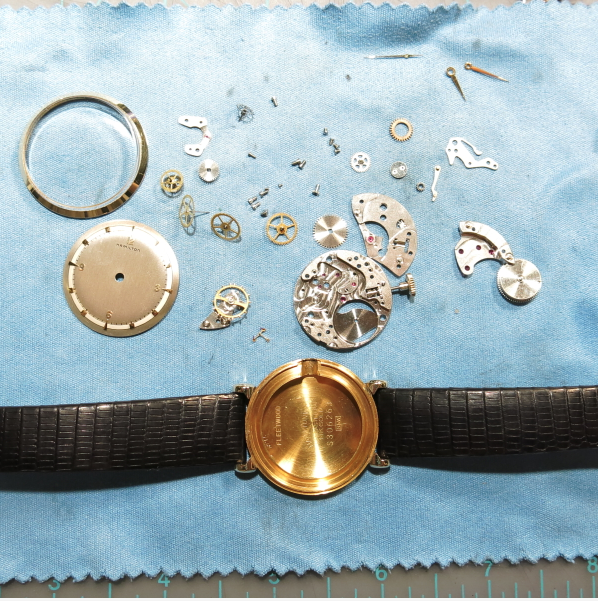 I tend to use International Dial Co for dial restoration. I've also used Eagle Dial. Both do nice work. There are some other options too but I have not tried them (yet). Commenting on this because my wife also has a 1953 Hamilton presentation watch that she inherited. It hasn't been worn in years and was kept in a jewelry box. Specifically, it's a gold Hamilton Automatic with numerals at the 12, 2, 4, 6, 8, and 10 positions. It was presented to a relative on April 3, 1953 for 30 years service and is so inscribed on the back. The gold expansion band is probably a replacement as it's a Speidel. The crown/stem is missing, however it still runs as I noticed when the second hand started running after the watch had been removed from the jewelry. Do you think it's worth the cost of restoration? You bet. Send me a photo to my email address and I'll tell you more about it. You can also contact me through my Etsy store.